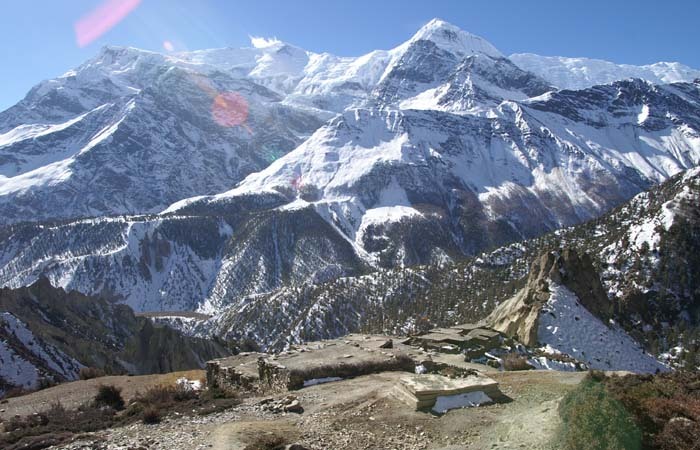 The Annapurna circuit trek is the longer version trek of the Annapurna region which is a trekker’s paradise. It comes from the fact that in one’s trek, one gets the pleasure of hiking distinguishable landscape, right from the tropical forest and wetlands to the harsh rugged wilderness all close to human habitation. You traverse through varying agrarian adaption of human civilization, cultural difference of ethnicity. 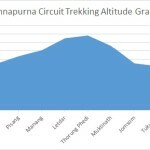 The grueling hike gives you the taste of nature and man as well as a three dimensional view of not only the Annapurna peak but a range of others. The trails are along fast flowing rivers, past protruding overhanging cliffs, to land in alpine or sub tropical vegetation and climates. Homes transform magically from thatched to tinned and then to stone built houses so does the ethnicity from the Aryans to the Mongolians and from Hindu temples to Buddhist Monasteries and Gompas. 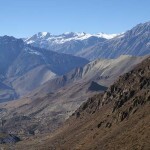 You would be fortunate to sight 1540 species of flora and fauna on the trek. 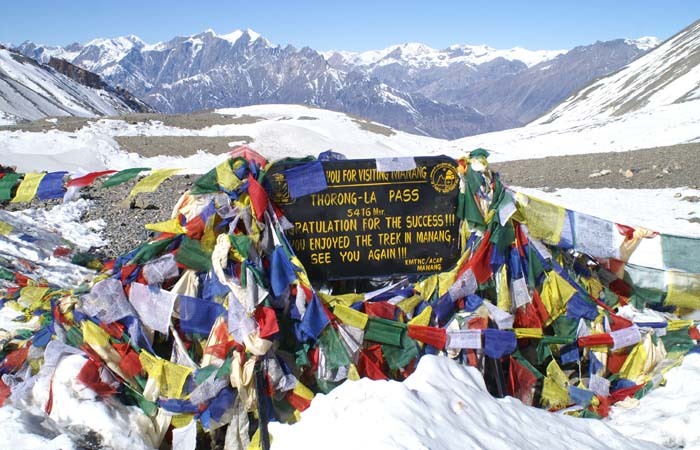 You hike from altitudes 1400 to 5416 metres at Thorang La Pass, well known for it historical importance and the local dwellers to graze their herds . 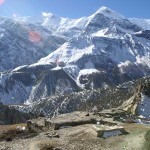 This is precisely why, Annapurna circuit trek is internationally renowned. 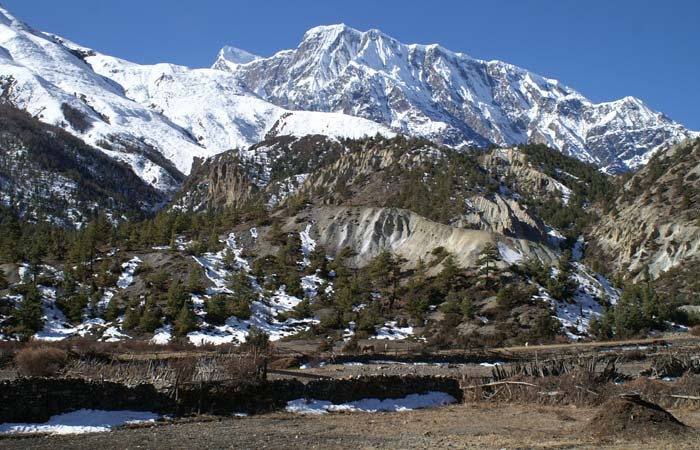 Your trek starts at Besisahar to Bahundanda where the ruins of the fortress of Lamjung Durbar is the highlight. Then, it is Chamje hiking over log bridges and along river trails. The homes of the denizens give ones the impression of medieval times. It is onto Bagarchhap, done in hanging rock trails and vast barren plateaus. 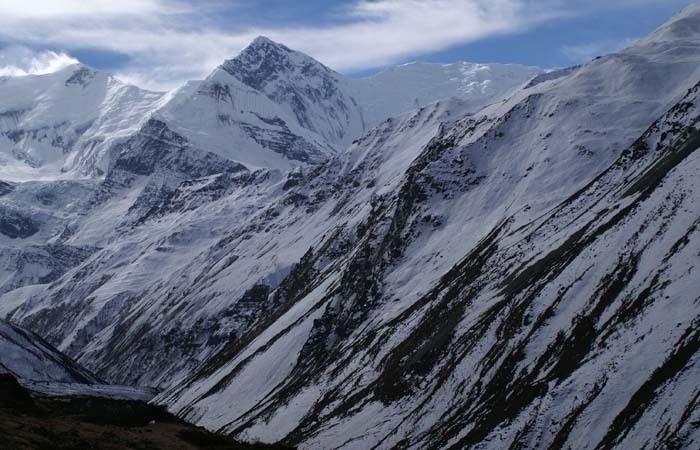 Lamjung Himal and Annapurna are some peaks you view along the way. The next is the trails through virgin vegetation, and peach and apple orchards. Then there is the magnificent rock face of Paungda Danda. 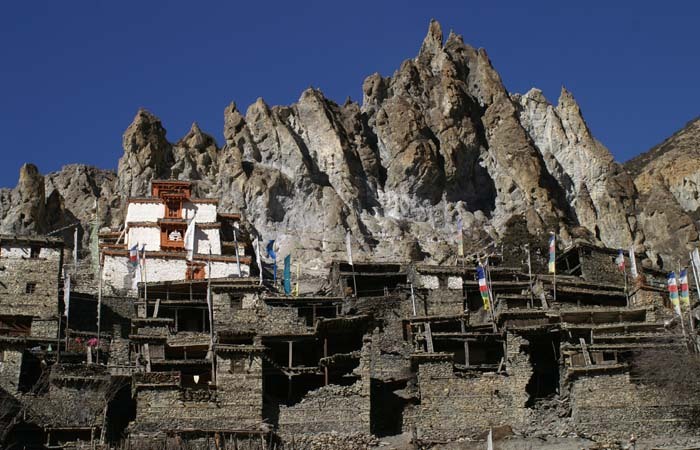 The hike to Manang give one the view of Milarepa Cave and also that of a Gompa and huge prayer wheels. 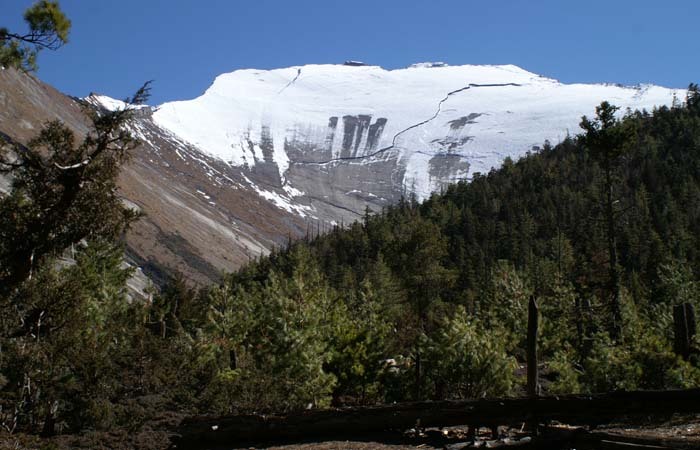 In Manang, you get to adapt to the high altitude and the chance to see Annapurna and Gangapurna peaks as well as hear ice falls and see glaciers which hang. 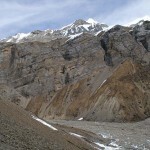 Next is along a east bound river to Letdar and Thorong Phedi. 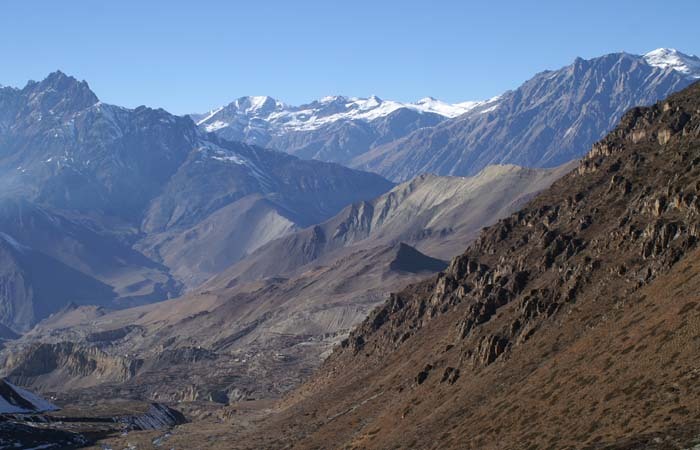 Then it is the Thorung La Pass to Muktinath and onto Jomsom. 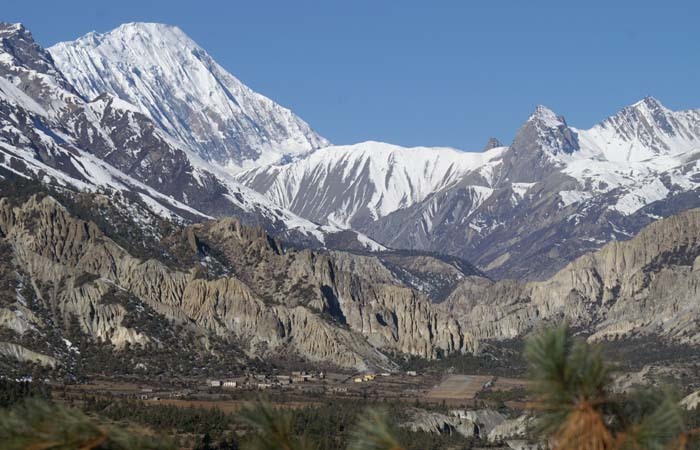 From here you hike to Tukuche via the Kali Gandaki river which has the deepest gorge in the world and then onto Ghasa getting the chance to view first hand Annapurna I, Manaslu and Dhaulagiri peaks. The next stop over is a Tatopani where you get to bath in a natural spring hot water and healing powers. From here it is onto Ghorepani where are water takes a shade of white where it its name come from. Tikhedhunga and Nayapul and the drive back to Pokhara, just to fly back to Kathmandu. 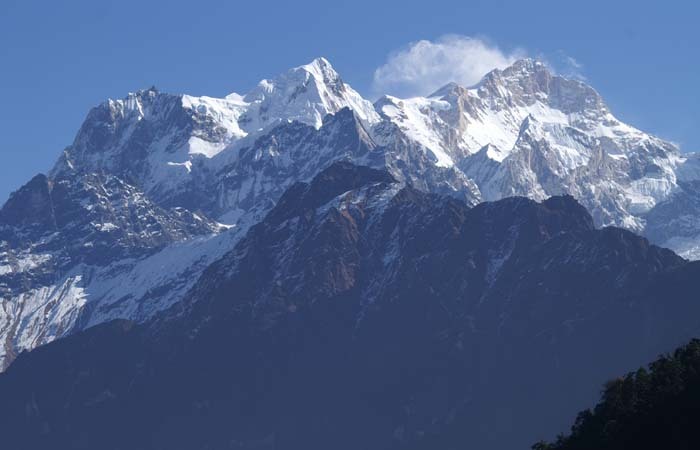 Our trek starts from Besisahar and it is a seven hour bus ride along with you guide that goes via with Pokhara, a tourist hub of Nepal. 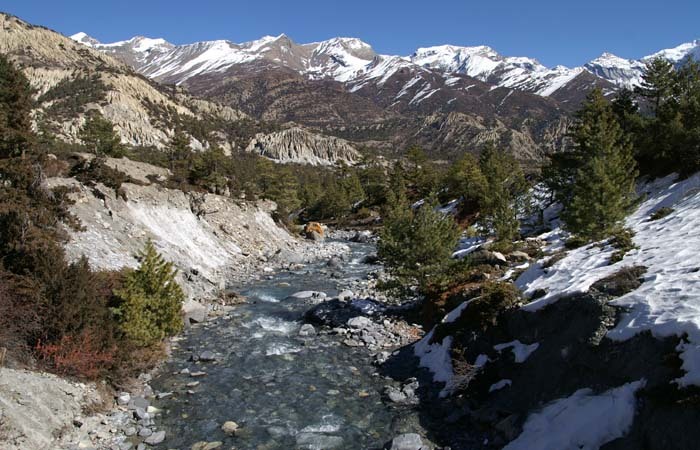 You will get you first taste of the winding rivers and the green forest of the mid-range of the Himalayan Mountain. O/N stay at lodge. 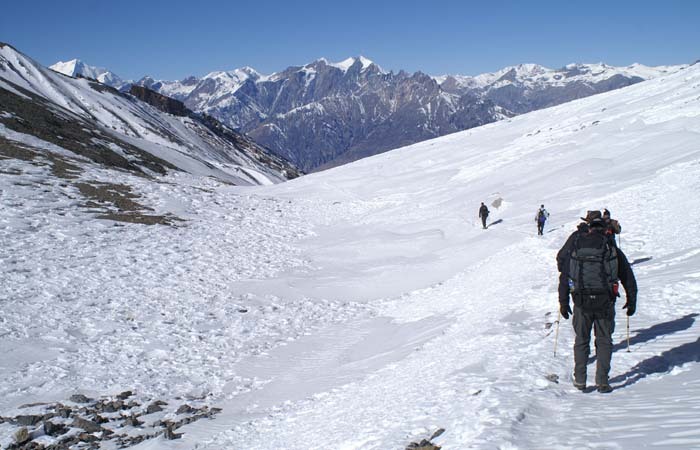 We start the day’s trek to Telekhu (2840m), after passing buckwheat fields and mani walls, then it is mostly level walk and few landslide hit areas and huge apple orchards to Bhratang. Following a new rock blasted trail we stay to the side of the river getting the dramatic view of Paungda Danda, plus others. Crossing the river and a gently ridge, we get to Dhurure Pokhari (3200m). 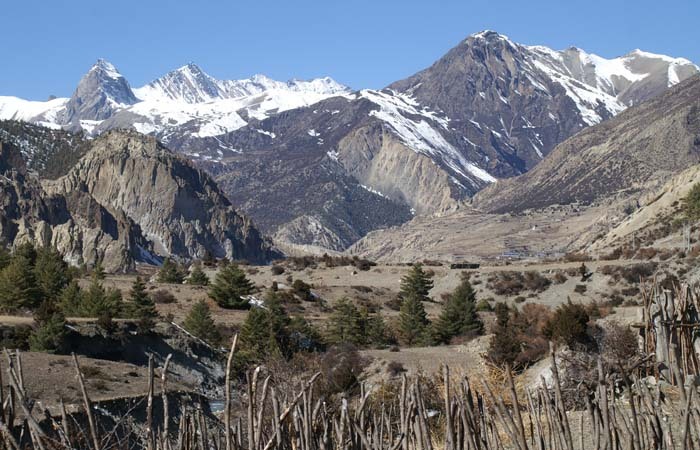 The mostly leveled trek across Manang Valley and eventually across a wooden bridge, we enter Pisang. O/N stay at a lodge. 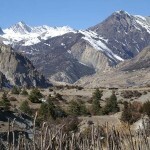 We head toward Jomsom which is an easy walk down hill and we get to our destination by mid afternoon. 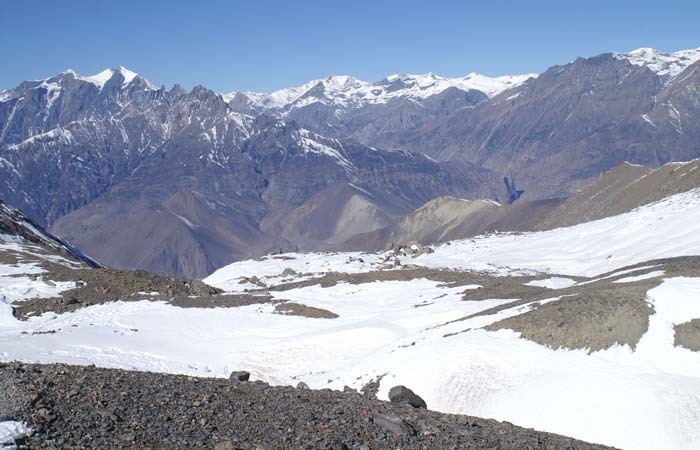 The rest of the day we get to rest or see surrounding peaks of the Annapurna region. O/N stay at Lodge. 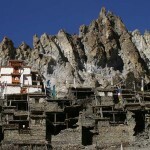 We trek to Marpha in the first stretch on a level path for an hour. 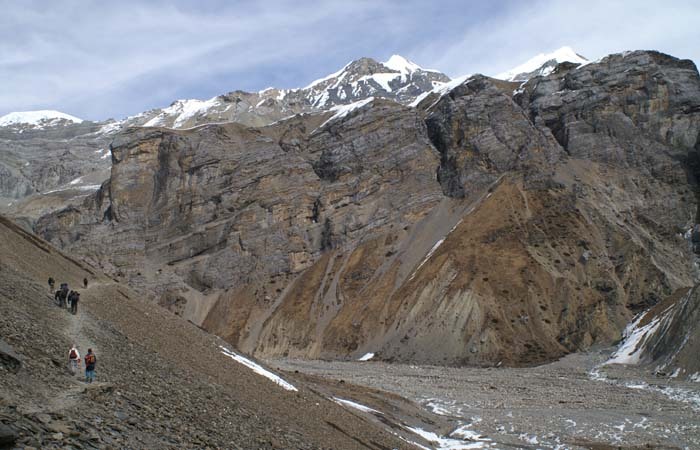 On leaving Marpha, we head towards Tukuche on the level path of the Kali Gandaki river all the while get the panoramic view Dhaulagiri Peak (8000m). Tukuche is a wonderful Thakali village. O/N stay at a lodge. Trekking towards Ghasa we cross a bridge and sandy landslide to descend into lush lowland full of forests and rivers and finally arrive at our destination. O/N stay at Lodge. 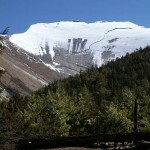 In the first stretch of the trek we head to Rupse – a hamlet with a wonderful water fall. 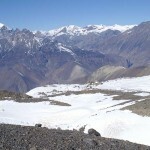 Then, we head to Dana and finally to Tatopani, a wonderful place to relax and freshen up in all its hot springs. O/N stay at lodge. 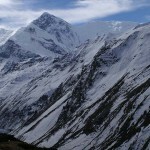 In the first leg of the trek we head to Shika (1920m) with an amazing view of the surround Himalaya. 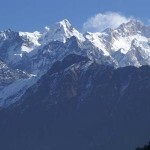 Then, we continue to Chitre all the way with the back drop of the Annapurna Mountain and finally Ghorepani. O/N stay at lodge. The first part would a seemingly climb up an endless flight of steps made out of crude steps with the back drop of forested vegetation to finally reach Ulleri. 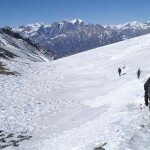 After numerous ups and downs and over streams gushing out from the forested foliage we reach Tirkhegunga. O/N stay at lodge. We first trek to Nayapul from where we comfortably get to Pokhara by a two drive and have the rest of the day to rest of sightseeing at Pokhara. O/N stay at Lodge. We fly to Kathmandu (40 min) and spend the rest of the day either resting or sightseeing buying souvenirs to take back home. 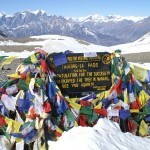 Notes: All of the trekking items are available in Kathmandu at nominal prices. 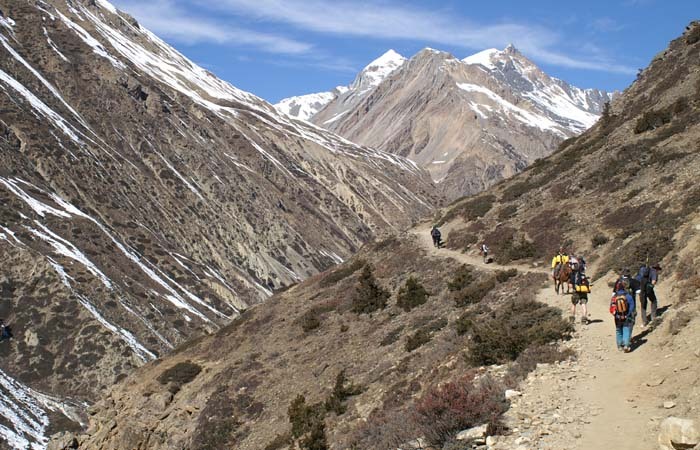 However we suggest you bring hiking boots from your home country if you decided to purchase these items in Kathmandu. Breakfast options includes Oatmeal,French toast,Chapatti, Tibetan bread, eggs, pancakes, muesli and for Lunch or dinner you can have sandwich, soups momo (dumpling), macaroni dishes, pizzas, noodles, steak, dal bhat (rice, lentils, veg platter) pasta etc. 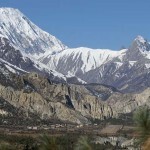 Pokhara to Kathmandu airfare ($98 per person). 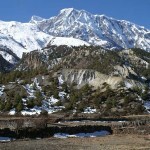 Annapurna Area Conservation and TIMS permit.